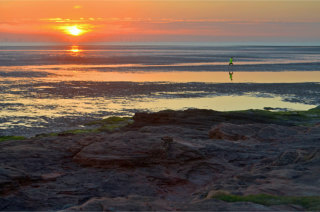 This is a linear walk taking in all of Wirral's northern coastline, from New Brighton to West Kirby. This coastal walk takes in both North Wirral Coastal Park and Red Rocks Nature Reserve and is approximately 12 miles long. We will be meeting in New Brighton at Fort Perch Rock car park at 10:00. Please note that the car park is currently free of charge, but many of you will be aware that Wirral Council are discussing introducing a charge. Fort Perch Rock is very close to New Brighton Station and I would suggest considering using the train. The walk will finish in West Kirby where there is an exceptionally good pub (The West Kirby Tap) which is handily close to West Kirby Station where, with one change at Birkenhead North, the train can be caught back to New Brighton.